In 2009, MGAN began as a partnership between academic institutions across the U.S., the National Science F oundation (NSF) and the Department of Energy's Joint Genome Institute. 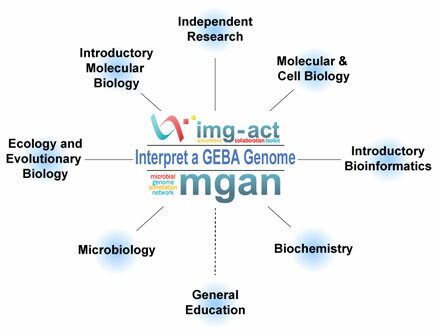 The DOE-JGI provided the microbial genome sequence data and training in the use of the online gene and g enome analysis toolkit called IMG-ACT. IMG-ACT was developed through a collaboration of the JGI, led by Genomics and Bioinformatics Education Director Cheryl Kerfeld, with undergraduate teaching faculty from across the U.S. and from several other countries. Over 365 high school, college, and university faculty have used IMG-ACT to engage almost 8000 students in gene and genome analysis as part of courses or independent research projects since 2008. The next generation of this platform, now called GENI-ACT (Genomics Education National Initiative - Annotation Collaboration Toolkit), was developed through funding from the National Science Foundation. GENI-ACT represents an updated and independent version of IMG-ACT, with new features added through a collaboration with the successful GENI collaboration p latform . GENI-ACT software was developed at Syracuse University (contact: Roy Welch, rowelch@syr.edu), the help desk will be run out of Hiram College (contact: Brad Goodner, goodnerbw@hiram.edu), and faculty training will be run out of Augustana College (contact: Lori Scott, lori.scott@augustana.edu). Previous users of IMG-ACT are encouraged to transition over to GENI-ACT. US Department of Energy Joint Genome Institute and other academic institutions.